The early 1990s were a strange time for video game characters. 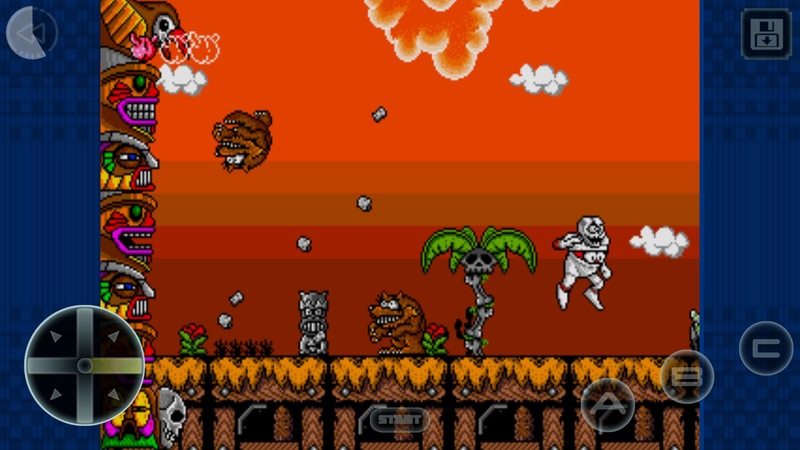 Side-scrolling platformers were without question the most popular games, to the point that just about every company had to come up with a mascot or three to put in their own spin on the genre. An awful lot of those characters were simple variations on Sonic the Hedgehog, throwing a pair of big googly eyes on some kind of anthropomorphic animal with an attitude in a vain effort to create some sort of familiar look. Licensed characters from other media and even real celebrities were also popular choices for similar reasons. Then there was Chuck D. Head. He’s a mummy with his face on his chest, which he stretches out to attack enemies. Sometimes he finds a head with another face on it, and he throws that head like a hefty boomerang as another means of attacking. Chuck is the star of DeCap Attack (Free), a surprisingly high-effort platformer from SEGA and developer Vic Tokai. Although DeCap Attack represents Chuck’s first (and I believe only) appearance in a video game, it’s actually the final game in a very loose series of titles. The first game appeared on Nintendo’s 8-bit NES console and was known as Kid Kool in the Western world. It’s a pretty terrible game by most accounts, nearly reaching “so bad it’s good" status. Nearly, but not quite. The next game in the series was titled Psycho Fox and was released on SEGA’s 8-bit Master System console. Actually, it might be a stretch to call it a separate game, since it shared many level layouts with Kid Kool. But it was a slightly more playable game, so let’s give it at least that. That brings us to SEGA’s 16-bit console, but the oddities don’t end there. In Japan, this third game was based on a licensed anime property called Magical Hat. There wasn’t much point in carrying an unknown license over to the West, but rather than make the bare minimum of changes to drop it the way so many other games did, SEGA opted to completely reskin the game. They also made a few small changes to the gameplay while keeping the bulk of the physics and stage designs the same. There are a few things that, for better or worse, all of the games in that series share. The main character always has a short range attack at his disposal, with a longer range ball-type attack available as a power-up. You’re always trying to get from one end of a stage to the next, and almost all of the games make use of multiple levels and routes. But perhaps the strongest shared characteristic can be found in the loosey-goosey physics. The main characters in all of these games are, for lack of a better description, very slippery. There’s a palpable weight to them, and the height of their jumps greatly depend on how much speed they build up first. This is one of the things that makes Kid Kool so aggravating, and it threatens to put the kibosh on DeCap Attack at times, too. Thankfully, unlike in Kid Kool, you can usually scroll the screen back in DeCap Attack. Your projectile will also return to you eventually whether you retrieve it or not. These two changes make it a lot less frustrating to make your way through the levels, and the SEGA Forever features of being able to save anywhere and rewind your playthrough by 15 seconds help to bridge the rest of the gap. DeCap Attack can still be incredibly frustrating at times, but its difficulty is probably more tolerable here than it has ever been. If you don’t have an MFi controller, you had better be a virtual button virtuoso if you want to make it through the game, however. Oh, and one heads-up to newcomers who might be used to just speeding through levels: the final stage of each area not only has a boss fight waiting at the end, but also requires you to find a special item hidden somewhere in the stage. If you don’t have it and try to leave, you’ll be spit back out into the stage to find it. 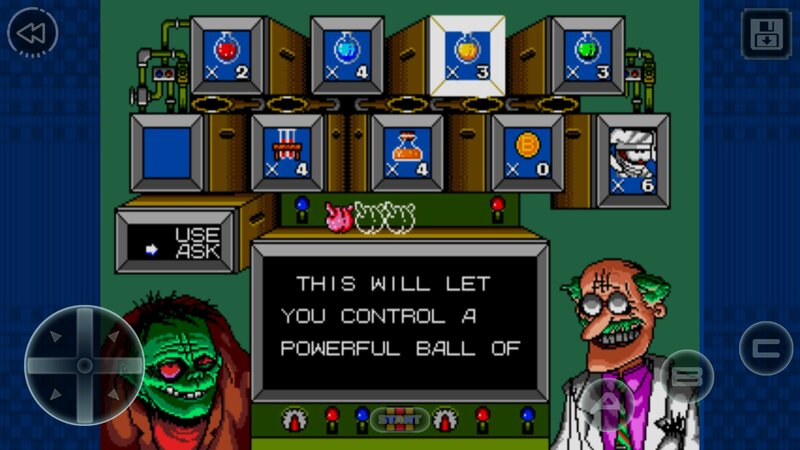 In addition to that special item and the head power-up, Chuck can also find a selection of potions and items scattered around. Unlike in many platformers, these items are not used upon pick-up. Instead, you can access a status screen that allows you to select and use them whenever you see fit. It’s probably best to use most of them during the boss battles, but I’m not going to tell you how to live your life. Since they’re tucked away on a separate screen, it’s easy to forget about them. I suspect DeCap Attack wouldn’t have quite as fierce a reputation if more people remembered these goodies. Mind you, you’d still have to deal with the fact that there aren’t any mid-stage checkpoints, but we’re living in a magical future where we can create our own mid-stage checkpoints. Take that, classic difficulty. DeCap Attack leans pretty heavily into its reskinned theme, which has the unfortunate effect of making the game’s areas feel a bit similar to one another from a visual standpoint. Some of the enemies feel a little out of place in such ghastly settings, too. But I think it’s worth it just for Chuck’s lumbering gait alone. He handles about as well as a cow on ice skates, but bless his heart, he’s not deceiving you. The poor guy looks like he’s barely keeping himself from face-planting at the best of times. The music is also quite delightful. The game’s odd choice of a horror presentation makes it a great choice to play on Hallowe’en or any other spooky time of year. If you’re familiar with the other recent SEGA Forever mobile releases, you should know the score here in terms of how this particular version fares. You can play the game for free with ad support, or you can pay a one-time IAP to get rid of the non-SEGA ads and activate a couple of extra features like offline play. The emulation is okay but not great. SEGA Forever has made major strides since its launch in this regard, but there’s assuredly a fair bit of track on the road ahead. The two biggest sticking points remain the audio, which occasionally glitches out or sounds off-tune, and the performance should if you have anything online going on in the background while you play. I also found the virtual controls to be oddly non-responsive at times in this game in a way that the controls of the other SEGA Forever releases weren’t. Nothing that can’t be worked around with a little patience, but still worth mentioning. DeCap Attack is a decent game from the SEGA 16-bit library. I wouldn’t say it was excellent even in its own era, and pouring it through virtual controls and a sometimes-finicky emulator doesn’t do it many favors. At the same time, if you look at this game in the context of the iOS library, it’s pretty darned fun. Chuck is a great character, even if he is weird as all get-out. There’s just so much personality in DeCap Attack that I found myself liking the game more than I probably should. 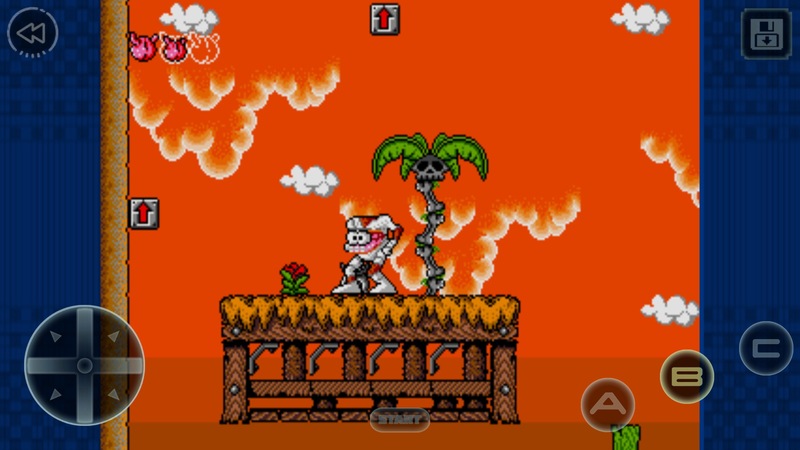 Easily worth the download, and the price to buy the IAP still feels like I’m cheating poor ol’ SEGA. The only question that remains is whether or not it’s worth investing time into. If you love platformers and don’t mind a challenge, I’d say the answer is yes.